A demising wall is a wall that separates spaces belonging to different tenants in an apartment building. It is even used to define the wall that separates private tenant areas from common areas used by more than one tenant. A simple example of a demising wall can be found in an apartment complex where two apartments share a common wall, and this wall is what separates the two apartments. Proper construction of a demising wall is extremely important as it needs to comply with smoke, fire and noise requirements. Construction of demising walls in areas such as elevator shafts, stairways, hallways and between private apartments requires special construction assemblies. Building codes are sets of rules that all developers and construction companies must follow. They lay down the minimum level of safety that is acceptable for different kinds of construction—both building and non-building structures. The purpose of the building code is to ensure that the occupants of a building stay safe and healthy. Building codes are determined by public authorities. Each nation has its own building code. Some cities, such as Chicago and New York in the United States, have their own building codes too. In a lot of cases, the building code may require the demising wall to have insulation. This helps to reduce the noise that goes out from a shared wall and can minimize complaints about noise. This is especially important in apartment complexes where different tenants share a wall or where the common areas are often used for big gatherings and parties. Building codes also require demising walls to have insulation in order to increase energy efficiency. When a demising wall has proper insulation, a tenant is able to control the temperature, heating and other conditions in their private space more effectively. They need to worry less about the conditions in the adjoining spaces as effective insulation ensures they only pay for the energy they use in their private space. This becomes even more important when a regular area is separated from an unusually hot or cold area by a demising wall—for instance, when a demising wall exists between a private apartment and a commercial kitchen/cold storage area. Most building codes also require demising walls to have a fire rating in order to protect the tenants and ensure the safety of the building. A fire rating refers to the total time that a particular material can withstand complete combustion. This is determined by a standard test. It is important for demising walls to have a fire rating so that fires are not spread from one tenant area to another. Demising walls with fire resistance are an important strategy to control fires and prevent them from spreading further. Many demising walls are treated with fire retardants to increase their fire rating. A good material to use in demising walls, and which has the right fire rating, is X Gypsum wallboard, 5/ 8” thick. A demising wall with a high fire rating will also limit liability in case of a fire. For instance, if a fire is caused due to neglect by one tenant, it will stay confined to that tenant’s space and won’t affect the common area or another tenant’s private apartment. If the fire were to spread to a tenant’s area when they were not responsible for starting it, then the building would be held liable by the tenant for damages. A demising wall with a high fire rating helps prevent this situation from occurring. Within a building, there will be some rules around what the tenants can and can’t do with the demising walls. Since demising walls represent the outer boundaries of their private space (unlike walls within their private apartment), tenants are usually not allowed to remove these walls. In some cases, tenants may also be prevented from installing particular kinds of items (based on size, weight, kind of item etc.) on or near demising walls. In most cases, the lease will ensure that such details are mentioned so that the tenants are aware of the rules when they first start living in the apartment. During a building inspection, an inspector will make sure that the demising walls comply with the requirements of the building code that applies in the jurisdiction. The inspector will also check the top and bottom sealing of the demising walls to ensure that the walls are completely compliant. Different demising walls have different design accommodations and each project identifies these requirements separately. In some cases, demising walls need to comply with UL (Underwriters Lab) standards. If there is an issue with the wall complying with the building code, the inspector cites the owner of the building and they have to fix the issues before the building can be used. Many firms manufacture reusable demising walls that can be installed and uninstalled easily. This is especially useful in office spaces and manufacturing facilities to section off certain work areas. 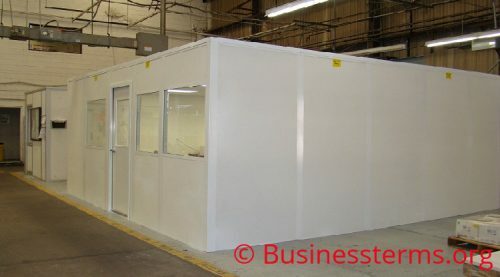 These walls are adjustable and panelized and offer industrial and office spaces the flexibility they need. Partitions can be added easily at any time, which is great for growing companies. At the same time, they come with the necessary fire safety measures to ensure that all building code standards are met. Best of all, they can be quickly uninstalled and then reinstalled at a different location, which gives young companies flexibility on a budget. In summary, demising walls are an integral part of most constructions, whether an apartment complex or a commercial facility. For builders, it is very important to document the safety and insulation specifications for the walls at the time of drawing up the plans so that they comply with the relevant building code. For tenants, it is important to read the lease agreement carefully to ensure they follow the building rules relating to demising walls. 1. True or false: Demising walls can be removed by just anyone. 2. True or false: there are rules around installing demising walls.